Wednesday, 6 March 2019, 7:52a.m. New Zealand's "resilient" demand for hard drugs is laid bare in a new report from the United Nations. 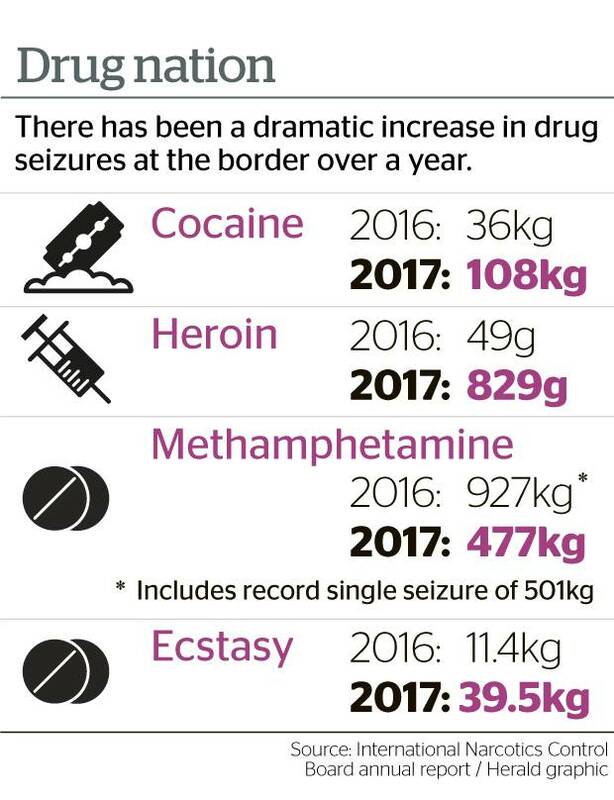 The UN agency tasked with upholding international anti-drug treaties outlines big increases in seizures of cocaine, heroin and ecstasy while noting high availability of methamphetamine. Drug and Addictions services worker, Darryl Wesley told Mike Hosking cocaine has become more prevalent in New Zealand. "Somebody mentioned to me that they thought the prevalence of heroin had gone up." "Ecstasy use, that's still around...but we are not seeing a spike in it at our level." Wesley said opioid addictions were handled by DHBs so he couldn't comment on them, but he said, anecdotally, he hasn't seen a rise. Synthetic cannabis is a real concern, however the main drugs they deal with are still alcohol, methamphetamine and cannabis, he said. Customs' enforcement manager Jamie Bamford told Kate Hawkesby New Zealand's always had a drugs market. "I would contest that heroin really isn't on the rise. We are talking really small numbers so if we get a few grams coming through, that can sort of influence the statistics but it's actually pretty low, we don't have a massive heroin appetite in New Zealand." "We pay amongst the highest prices in the world...so as long as we continue to pay that, they will continue to supply us." Bamford said there are a number of links to organised crime in the Americas and New Zealand. "That obviously brings with it cocaine. We know Australia has quite a large cocaine market and we think that not only have some of the cartels been supplying Australia, but they see New Zealand will pay a high provide sp they transport through New Zealand." He said people will try to smuggle drugs in every way known to man. "Last week we had 110 kilos of meth seized in golf cart batteries. We have it in people, on people, in containers, in anything you can imagine." "We have had it mixed in with concrete umbrellas, we have had it in liquid form," he said. "So if you can imagine it, it has happened." Bamford said New Zealand Customs is doing a fantastic job stopping drugs from getting into New Zealand.